We are hoping for a lively program on March 4. There must be lots of talent out there in all our Granges just waiting to shine on stage at Ekonk. Remember to check the rules of the contests in the Blue Book. 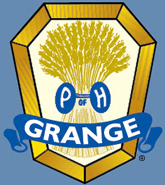 Subordinate Granges within any Pomona may combine forces to enter the A-Number contest. The theme this year is “vacation.” See you there. Winter is upon us, oh woe, oh woe is me! It’s time to shovel, scrape the ice, undecorated the tree. But March is coming! So is spring! So chin up! Don’t feel down. Just bring your skit or talent and head for Ekonk town.